On Episode 94 of Inside the Marketplace, Priest talked with Courtney Reum co-author of Shortcut Your Startup and an entrepreneur who went from investment banker to an owner of a startup, VEEV Spirits which he sold to starting M13 to help investors out. An interesting piece of the conversation is hearing Priest and Courtney discuss the process of entrepreneurship in that it’s not always your first idea (or second, or third…) that takes off. They discussed various industries that might be harder than others to find success in and this is fairly relevant because as it turns out, Beer, Wine and Liquor stores typically have one of the highest failure rates among startups as only 3.4% last more than 4 years. It’s actually a studied fact that if you have failed before at starting a business you have a 20% chance at success versus just 18% if this is your first attempt. Likewise if you have had a successful startup previously, your next startup has a 30% chance of success. There’s a learning curve to this thing and it’s important to keep that in mind. Never let the lows of the failure eat you alive. The very next attempt could be the one where you take off! So let’s talk a little bit about how to go about this process. 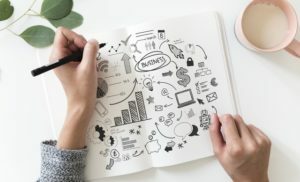 There’s a lot to consider when starting a business. Keep in mind the startup learning curve. When determining what kind of business to start up it’s important to read the market. If you have a burning white hot passion for a specific type of business or even product that your business will specialize in, that usually only gets you part of the way to your goal. Less than 50% of startups make it past the first 4 years. Only 40% of all small businesses are profitable at all, while 30% break even and 30% are losing money. The numbers seem stacked against you succeeding so it’s important to keep in mind a few things. Make sure you have a solid grasp or expertise on the market you’re going to enter. Lack of knowledge accounts for 11% of business failures. Lack of experience running a business or incompetence of course are the majority of the reasons businesses fail but assuming you’ve nailed at least some of that down by taking the reigns in similar areas with your previous workplaces you might escape that statistic… OR you could end up like a LOT of other people and it takes your next opportunity to be the one where the previous growing pains pay off. Another thing to consider is having an equal (and competent/experienced) partner. Having multiple people to help divide up the work, bounce ideas off of, expand your networks to raise additional capital and they can help talk you out of the biggest no-no in new business: attempting to expand too soon and being unable to scale properly. Everyone sees the dream scenario end goal where what they do goes regional or national and is distributed everywhere but you need to be patient and grow at an appropriate rate. Some people jump when they can’t possibly clear the landing. Not to mention that extra capital thing? It’s huge. Of the businesses that fail, 82% do because of cash flow problems and 27% said it was because they never received the funding they needed. Slice it up and hand out some of the pie, or at least just a little. In every one of those industries, you can find innovative ways to deliver products or to make information easier to access to transfer or to lower costs or to automate… everything and anything. The sky is the limit. Profitable right now or not, you have all of the tools to make this work right inside your head already. You develop the product or business model. You raise the capital and bring in the partners as needed and you scale distribution. Now all you have to do is move forward… and in doing so remember, it’s okay to have to step back as well. Remember, there’s a learning curve to this thing.